Our sixth Headache on the Hill event will be held on April 8 and 9, 2013. For more information, see the HOH 2013 FAQ and the HOH 2013 Participant Application. Thank you to everyone who supported this initiative! The time for signing thee petition to Congress regarding a Congressional hearing on the impact of Migraine, cluster headaches, and other headache disorders has now passed. The petition to Congress asking them to hold the first ever Congressional hearing on the impact of Migraine, cluster headaches, and other headache disorders is still open for signatures. You can help by signing it AND by encouraging other people to sign it. We’ve prepared a one-page flyer that you can download then email to others or print and hand out. Download the flyer. September, 2007: 45 participants from 29 states visited 136 Congressional offices. February, 2009: 35 participants from 27 states visited 127 Congressional offices. 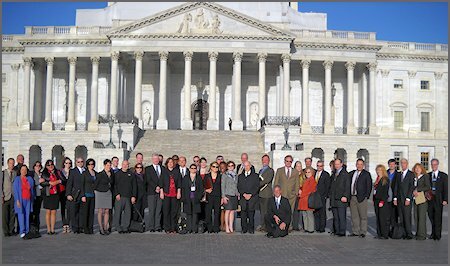 February, 2010: 52 participants from 35 states visited 144 Congressional offices. 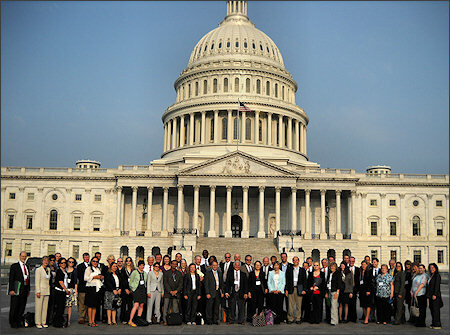 The next Headache on the Hill event is scheduled for May 31 and June 1, 2011. For more about what the AHDA has accomplished, please see our February 2011 ADHA Overview. We’re pleased to update you on the interim progress of 2010 AHDA legislative efforts. As previously mentioned, 2009 AHDA efforts led to report language regarding headache disorders that was included in the fiscal year 2010 House appropriations bill (see report language). This report language specifically requested that NIH send a report on their progress towards defining Headache Disorders Research Benchmarks to the Committees on Appropriations. The NIH report that resulted from this congressional request outlined the NIH programs that have been available over the past several years for headache researchers, as well as the steps NIH has taken to organize the major research planning meeting which ultimately took place in Bethesda, MD on May 16th and 17th. An open meeting of the people interested in the AHDA was held on Friday June 27, 2008 at 10:30 a.m., during the 50th Annual Scientific meeting of the American Headache Society in Boston. Our proposed congressional appropriations report language* is due to be discussed (“marked up”) later this month in the L-HHS Subcommittees of the Senate and House Appropriations Committees. 12 Representatives and 2 Senators made specific written requests to the L-HHS Subcommittees to include our language in the appropriations reports. While such inclusion would not carry the weight and force of law, it would provide NIH with the sentiment of Congress on this issue and we are told would be taken very seriously by NIH. We are very optimistic that our language, in whole or in part, will be included in the reports. Migraine alone is the 12th most disabling disorder in the US. The NIH expended less than $10 million in 2006 towards all research on headache disorders, comprising less than 0.05 percent of its total budget. For more headache and Migraine facts, see our Headache Disorders Fact Sheet. Please note: Although the AHDA is a nonprofit organization, it is classified as a lobbying group. Therefore donations are not tax-deductible.